After months of preparation, this year’s Great British Rhythm and Blues Festival has finally arrived. The directional signs are up, the venues have been decorated and the acts have been confirmed for what promises to be a weekend to remember! As the musicians carry out their last minute sound checks, scores of fans have started to descend on the town, ready to listen to some unforgettable Blues tunes. With some top-class, quality headline acts, some new, young talent and some Festival favourites, the 26th Great British Rhythm and Blues Festival is ready and raring to go! From authentic electric Blues, through to rock, jazz and acoustic sets, there really is something for every one of the thousands of visitors expected this August Bank Holiday weekend. Pat McManus kicks-off the proceedings on the International Stage at 7-30pm tonight, with another 600 musicians following suit at the eight official venues over the four day festival. Some other names to look out for on the International Stage this weekend include, Coco Montoya, Avery Sunshine, Nikki Hill, Davina and The Vagabonds, Courtney Pine, Billy Boy Arnold, Mike Vernon and Tommy Castro. In fact, there’s something for all Blues music fans at all of the official venues – the British Stage at Pendle Leisure Centre, the Acoustic Stage at the Lesser Muni and the roadhouses– Colne & Nelson Rugby Club, The Admiral Lord Rodney, The Crown Hotel, Colne Legion – and new for 2015, The Little Acoustic Stage at The Little Theatre. Barnfield Construction, are once again this year, sponsoring the official roadhouses. Highlights on the British Stage will include festival favourites Sean Webster, The Revolutionaires, Aynsley Lister and Kyla Brox, along with her father Victor, performing alongside the likes of Babajack and the Dana Dixon Band. 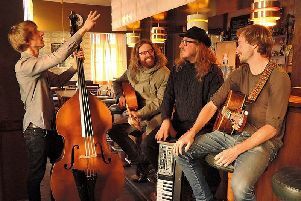 And the Acoustic Stage ones to watch include Blue Swamp, Phil Shackleton, Joni Fuller and the Leeds City Stompers, all on stage at The Lesser Muni. One band looking to building on an already impressive 2015 is Good Foxy, who after a series of nationwide auditions, managed to a land a spot on the Jessica Foxley Stage. Last month the five-piece band supported rock legends Status Quo at their Hoghton Tower gig while September sees the release of their debut album. The band are one of only seven of the UK’s best unsigned Blues artistes to have been selected to play at the festival in Colne. They are led by 19-year-old drummer and percussionist Callum Sykora with George Banks (also 19) on guitar and vocals, Freddie Bruhin-Price (20) on bass and vocals, Henry Crabtree (20) guitar with Ames Robinson (20) on harmonica and vocals. The band formed in 2013 over a shared love of music. In the past two years they have gone from strength to strength, recording their first EP and releasing their first video “High Watt” with more than 14,000 views on Youtube. Playing packed out gigs at prestigious venues like: The Plug Sheffield, The Academy, and Night & Day Cafe in Manchester. The Festival Box Office will be open all weekend for anyone wanting to buy a last minute ticket to see some of the big names on the main stage; and for those simply wanting to soak up the atmosphere and enjoy some great live music, then you can buy a Pledge Badge for just £4, which will give you access to the British Stage and the Acoustic Stage for the whole four days, or pay just £1 for a Roadhouse Wristband which will get you into all of the five official roadhouses for the full weekend. For a detailed line-up of all the acts and times they will be performing, visit our website www.bluesfestival.co.uk or call the Box Office on 01282 661234.